COLOMBO: Pakistan and Sri Lanka on Sunday agreed on expanding its relationship from defence cooperation to an “overall comprehensive engagement” involving trade, communications and culture. President Zardari in a one-on-one meeting with his Sri Lankan counterpart Mahinda Rajapakse at the Presidential Secretariat overlooking the Indian ocean, held extensive talks on bilateral, regional and global issues. During the exclusive meeting that lasted for one hour, the two presidents agreed on taking the existing level of Pak-Sri Lankan relationship to “new heights”, encompassing a multi-sectoral engagement in addition to defence, that had been a major sector of collaboration between Pakistan and Sri Lanka in the past. President Zardari said Pakistan greatly valued its close relationship with Sri Lanka and said both countries always stood by each other in turbulent times and shared commonality of views on regional security. He said Pakistan was happy to note that the Sri Lankan government had been able to defeat terrorism, and stressed the need for joint cooperation to counter this menace. He said Pakistan always supported the unity, territorial integrity and sovereignty of Sri Lanka and assured that despite its own economic difficulties, Pakistan would continue to contribute towards the socio-economic development of Sri Lanka. President Zardari noted significant increase in volume of trade between the two countries in the last four years after the signing of the Free Trade Agreement but stressed that both sides needed to continue striving, jointly, to further expand their commercial ties. He also called for fast-tracking negotiations for including the services sector in the FTA for promoting investment and trade facilitation between the two countries. Both sides recalled the encouraging trading framework that has been built up between Sri Lanka and Pakistan over the years with a Free Trade Agreement, a Joint Economic Commission and agreements on Investment Protection as well as on the Avoidance of Double Taxation. 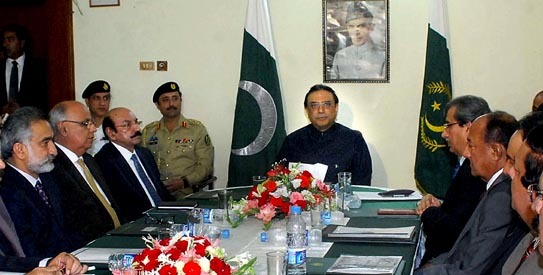 President Zardari emphasized the need to reactivate the Joint Economic Commission (JEC) to facilitate bilateral economic cooperation and monitor its progress. He pointed that the last meeting of the JEC was long overdue, with the last being held way back in 2007 and called for holding another round in Colombo. The President also appreciated Sri Lanka's timely assistance to Pakistan in the wake of the recent catastrophic floods in the country. During the talks the two countries identified cooperation in cement, sugar, dairy production, chemical plants, textiles, tourism and pharmaceutical as potential areas of mutually beneficial collaborative projects. The two leaders said they would continue to closely coordinate positions on regional and international forums. The exclusive meeting was followed by the delegation level talks after the two presidents witnessed the signing of three agreements and a Memorandum of Understanding on waiving off visas for officials and diplomats, cooperation on customs, agriculture development and cultural exchange. Foreign Minister Shah Mehmood Qureshi, Defence Minister Ch Ahmed Mukhtar and BOI Chairman Saleem Mandviwala signed the respective agreements from Pakistani side. Earlier, President Zardari arrived at the Presidential Palace in a motorcade led by outriders of military police and horse-mounted cavalry guards. The Sri Lankan President received President Zardari at the historic building and greeted him amidst splendid ceremonial welcome for the dignitary. Foreign Minister Shah Mehmood Qureshi told APP that the meeting of two presidents discussed waiving off the requirements for official and diplomatic visas with Sri Lanka and restore the flights of national air career to Colombo. He said the ending of visa conditions and the restoration of suspended PIA flights to and from Colombo from March 2011, showed the two countries' goodwill to increase connectivity for their mutual benefit. He mentioned that currently only the Sri Lankan Airways was operating three flights a week from Karachi, adding that the restoration of PIA flights would enhance people to people and business contacts. Qureshi said Pakistan and Sri Lanka intended to reinvigorate the Joint Economic Commission and increase political consultations. “We want the architecture of enhanced relationship between Pakistan and Sri Lanka to be stronger,” he said. Regarding defence cooperation, Qureshi said the two sides are also discussing more sales of equipment. He said Sri Lanka evinced interest in purchase of Pakistani al-Khalid Main Battle Tanks, light weapons and ammunition, and the Sino-Pak joint venture product JF-17 Thunder aircraft. He said the China-Sri Lanka relations were also gaining strength and this would be good for the benefit of the three countries. Qureshi said Pakistan-Sri Lanka Free Trade Agreement was already in place with high potential of increasing it manifold.